Just did: an hour work out and burnt off 1000 ugly calories! Waiting for: My mom to get home so I can go grocery shopping for hot dogs, hamburger buns and potatoes! Looking Forward to: November 20th, early Thanksgiving. November 22nd, moving to Sweden. Thinking about: How much it's going to cost me to send ANOTHER box to Sweden. My life in the past 2 years has involved paying a lot of money to post offices to ship all my goodies across the Atlantic. What I'm feeling: Sweat dripping down my back, time to shower ASAP! What I am making tonight: Jamin and Justin (brother and his brother-in-law) are coming over to unpack Christmas decorations for my mom, so I will make them a Gothenburg speciality! Halv Special. Hot dogs with mashed potatoes on top and grill seasoning! SOOO delicious. I'll also make some white chocolate popcorn for Emma and Tanner! In Sweden, couples share a bed, but use twin comforters. Even with that, I still steal the covers from him sometimes! Just thought you should see this. 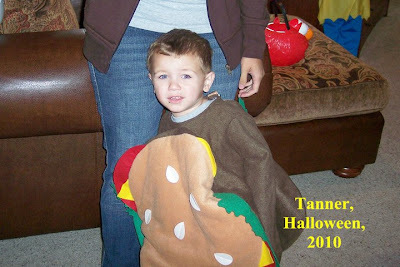 We call him the Tannerburger!